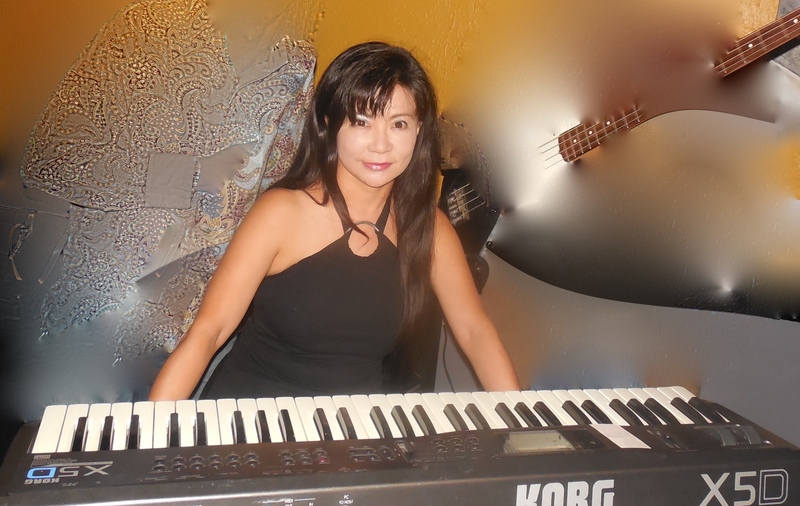 Choko Kimura Aiken is guest for the May 5, 2019 SuperJazz concert. Internationally known Jazz Pianist Choko Kimura Aiken will be the guest artist on the May 5, 2019 SuperJazz Concert. Choko, born and raised in Japan, began studying classical piano at the age of three. She studied piano, violin, voice and music theory at Colleges in Tokyo and Fukuoka as well as making journeys to the United States to study jazz in LA and NY. Her “Imagination” album, recorded in LA in 2011, was featured in that years February issue of “JAZZIZ” magazine. Choko left her long time group Tri-Voices and other long-associated bands to relocate to Birmingham in January 2013 after meeting her husband Jeff in Tokyo. He was one of several runners sent to a race by the Birmingham Track Club. Since that time Choko has enjoyed playing in the Magic City at many of its local venues which include the 4th Avenue Jazz Festival, Moss Rock Festival, Creek Bank Festival, Mt. Brook Arts Festival, Eric Essix Jazz Escape and as always she looks forward to continuing on with her main goal of simply making people “Happy” with her music! John Carroll Catholic High School Auditorium. Marc Phillips is guest for Feb 17, 2019 Concert. Our guest artist for the February 17, 2019 concert will be Vocalist Marc Phillips. Marc Phillips is a musician and songwriter. He grew up in Jasper, playing piano, trumpet and french horn. He also sang in his church and school choirs. He continued his musical studies in classical guitar at Jefferson State Community College and voice at Birmingham-Southern College. Phillips joined the band Hotel as a vocalist and keyboard player. He wrote many of the songs on their MCA albums, “Hotel and Half Moon Silver”. In 1981 he and Tommy Calton put together the band that became, at Phillips’ suggestion, Split the Dark. He is more well known currently for the band Marc Phillips and Groove Daddy. In 1989 Phillips and Joel Bouchillon founded Airwave Recording Studios. His production work has included pieces for Alabama’s Sesquicentennial, a ballet (“Seasons”) commissioned by the Birmingham Ballet Company, and several award-winning advertising campaigns for United Way, South Central Bell, and Toys for Tots. He has also written many songs recorded by national artists, such as “Hold On To The Night”, recorded by James Ingram and by Dan Hill. In 2003 Phillips released a solo album of Christian music called “Color Me His”. Marc is also a throat cancer survivor. Gates open at 2:30, Concert begins at 3:00. Hosted by the John Carroll Band Parents Organization. Adults and Seniors – $7. Students from any school or college $3. This is the 3rd of 4 SuperJazz concerts this season. The 4th and final concert of the season will be on Sunday, May 5, 2019. Rickey Powell is guest for November 18 concert. Our guest for the November 18, 2018 concert is Jazz Vocalist Rickey Powell. Birmingham theater and music legend, Rickey Powell grew up singing in the church and performing in school musicals and plays, but he says it wasn’t until 1969 during the time he was attending Talladega College, that he had an experience that told him that maybe he belonged in the theater. He had won a spot as a dancer in a production of Hello Dolly, being produced by James Hatcher, who was the Director of Town and Gown Theater. Rickey didn’t even have a singing part, he was one of the line dancers, but he said that he knew during those rehearsals that the theater was where he belonged, that it was where his heart was at. Shortly after completing his degree at Talladega College Rickey took off for the bright lights of New York City. He worked his way through a number of off Broadway engagements before finally getting his first big break when he was selected to be a member of the cast of “The Wiz” on Broadway. He also toured in the off-broadway company of “Hair”, performed with Chic Organization, Village People, Herbie Mann and various other artists. He has toured in Europe with Gloria Gaynor, Queen Esther Morrow and with The Harlem Gospel Singers. Since returning to Birmingham, Rickey has remained a staple of the Birmingham theater community. Over the past decades he has lent his voice and his talents to some of Birmingham’s most memorable productions, including the 1989 version of the “Dream Lives”. In addition to his work in theatre, Rickey is currently vocalist with The Birmingham Heritage Band. Today Rickey Powell is a Birmingham musical treasure. This will mark his first appearance with SuperJazz in six years, and we are thrilled to have him back. Carol Downey is guest for September 23 concert. 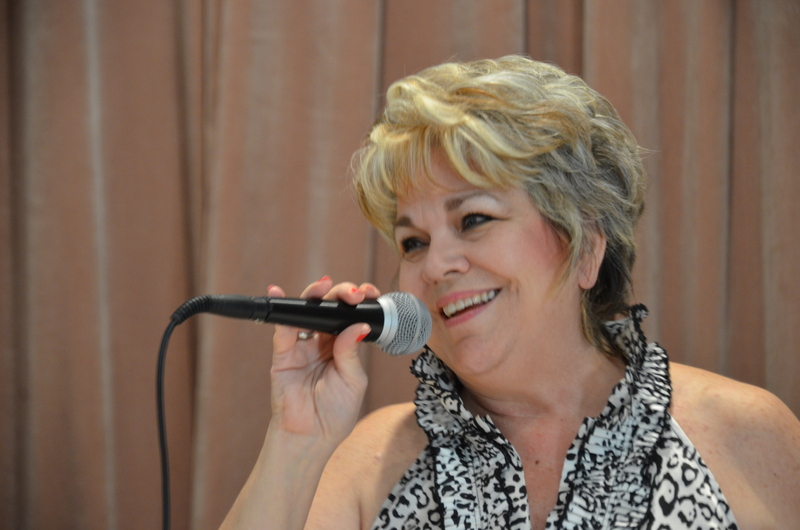 Carol Downey will return as our featured guest vocalist for the Sunday, September 23, 2018 concert. Her first guest appearance with SuperJazz was in 2013. This also marks the return of SuperJazz concerts to John Carroll Catholic High school, which was home for SuperJazz from 2002 – 2007. Admission at the door, no advance tickets. This concert series is a joint project of SuperJazz, The John Carroll Catholic High School Band, and the Band Parents organization. SuperJazz will be moving back to John Carroll Catholic High School for the 2018-2019 season. Our first concert at John Carroll will be Sunday, September 23, 2018 at 3:00 PM. UAB. 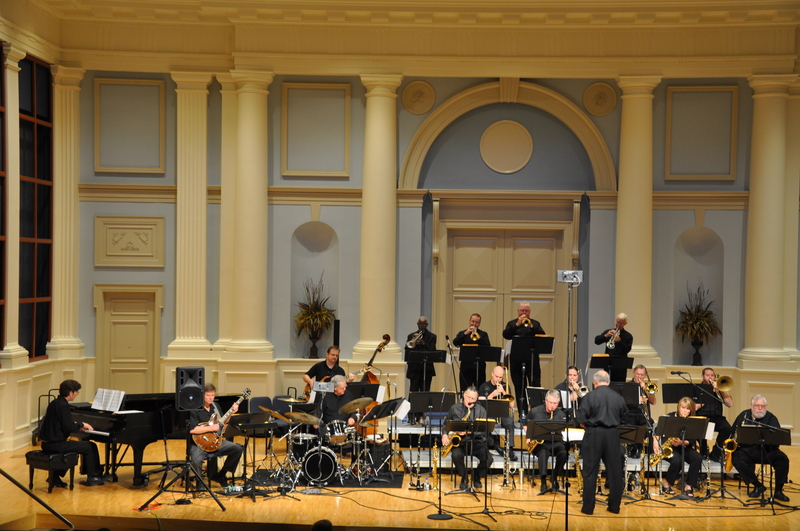 When the Alys Stephens Center opened in 1996, SuperJazz moved the concert series to the new Jemison Concert Hall for 8 seasons. When the Stephens Center was no longer available to SuperJazz at the end of the 2002 season, a study of our mailing list dictated a location in the Homewood area. John Carroll Catholic High School generously offered rehearsal space and use of the 600-seat auditorium. Our stay at John Carroll lasted five years. When Samford University opened the new Brock Recital Hall adjacent to the Wright Fine Arts Center, several members of the Samford instrumental music faculty encouraged the band to move the concerts to Samford. We made the move at the beginning of the 2007-2008 season. After 11 years at Samford, SuperJazz is again returning to John Carroll Catholic High School. The larger auditorium with its convenient and ample parking space make an attractive venue for our concerts We are renewing our partnership with the John Carroll Band program, and the John Carroll Band Parents organization. The new band director at John Carroll Catholic High School, SuperJazz member Dr, Mark Foster, and the new Principal, Dr. Anthony Montalto, have been extremely helpful in making this move possible. Jazz Flutist Kim Scott will be the guest artist on the SuperJazz Concert February 25, 2018. Kim Scott is one of the most sought after classical and jazz flutists in the country. Born and raised in Birmingham, Alabama, she burst onto the jazz scene in 2011 with her debut CD “Crossing Over”, which received rave reviews from the music industry. After a very successful global campaign, her debut CD made it to the BDS Billboard and Smoothjazz.com charts bringing her into the forefront with visibility across the world. Known for her hauntingly beautiful, unique tone and for her polished technique, Kim Scott is a fresh sound for today’s increasingly popular smooth and urban jazz music industry. Scott O’Brien of Smoothjazz.com states, ” Exceptional tone and polished technique will leave you wanting more from this brilliant player” and Ron Jackson of The Smooth Jazz Ride says, ” The one virtue that stands out when you listen to Scott…her delivery and technique, which can make any tune her own, be it a cover or not. Give her a listen, and I’m betting that you too will become a believer”. She has been in high demand for her high energy performances, having been invited to play the Preserve Jazz Festival, Atlanta Smooth Music Festival, Steel City Jazz Festival, Seabreeze Jazz Festival, Greater Hartford Festival of Jazz, Music City Jazz Festival and Catalina Island Jazz Traxx Festival, among others. She is also a member of the all-female jazz super group, Jazz in Pink. Chair of the Music Department at the Alabama School of Fine Arts, she has been an educator for 15 years and prides herself on passing her musical knowledge onto her students. Classically trained, she is a member of the Tuscaloosa Symphony Orchestra and the Kimoni Duo, and performs in solo recitals and concerts across the United States and abroad. She is also a National Board Certified teacher and has received many awards and teacher fellowships. Kim Scott is the host of the “Block Party” Radio Show, a nationally/internationally syndicated jazz radio show which airs weekly in several markets across the United States and Australia. She can be heard across the airwaves weekly as an artist and radio host. Mark Edwards of Smoothjazz.com puts it this way, “Let Kim Scott’s sensual style take you on a journey, one that will never have you thinking the same way about Smooth Jazz flute ever again”! Kim Scott’s sophomore CD, “Rite of Passage” was released May 18, 2013 and has taken the world by storm. The first single released from the CD, “Golden”, was the #1 most played/most added track the day it was released, gaining her even more recognition as one of the hottest new flutists on the scene. Produced by Kelvin Wooten, “Rite of Passage” features some of the funkiest and soulful grooves by this artist and the latest single from it, “Block Party”, peaked at #11 after fourteen weeks on the BDS Billboard chart, #16 on the Smoothjazz.com chart, and #6 on the Smooth Indie Star chart. Her single “Sizzle”, written by her and Lin Rountree, was at the top of the national smooth jazz charts hitting #11 on the Billboards. On September 16, 2016, Kim Scott released her third project “Southern Heat”, on Innervision Records Label which features dynamic collaborations with trumpeter Lin Rountree, Kelvin Wooten and Eric Essix. SuperJazz concert Sunday, February 25, 2018 3:00 PM, Brock Recital Hall, Samford University. We welcome the Pelham High School Jazz Band to open the concert. No advance tickets, Admission is “at the door”. Samford University Students, Faculty & Staff are our guests.